With the power of the internet and communicative nature of the blogosphere, undiscovered Paris finds are few and far between. So while some of my new favorites may not be untapped resources, I hope they may find their way into at least a few readers’ Paris folders for future reference. 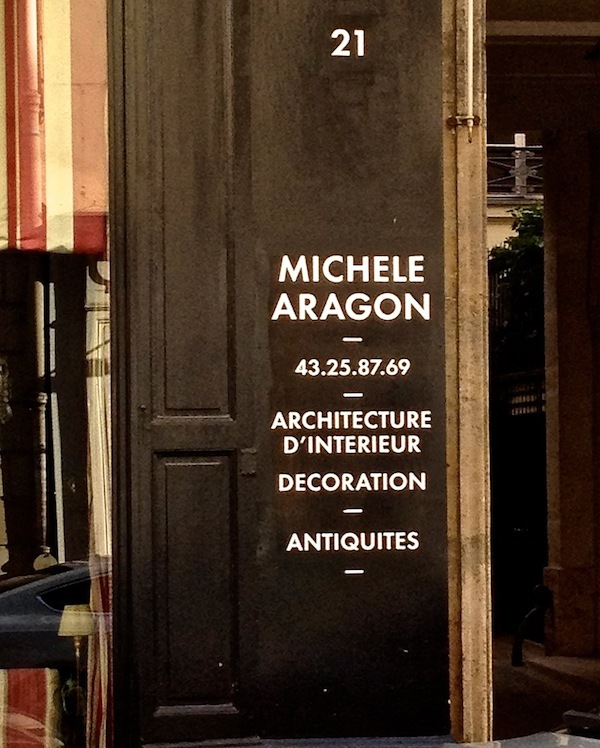 Undoubtably one of my favorite new discoveries, thanks to my sister’s unerring nose for the rare and refined, is Michele Aragon’s amazing shop on Rue Jacob in Saint Germain. While some may wish to bury their ashes at Bergdorf’s (as I do on some days), I would most often opt for mine to be spread in someplace like this elegantly cramped emporium of eclectic and exquisite finds. I unfortunately have very few photos to share. I was so excited visiting that I dare to admit I momentarily forgot about you readers – my apologies. With every inch accounted for, it was almost tortuous to try and see everything in one viewing. 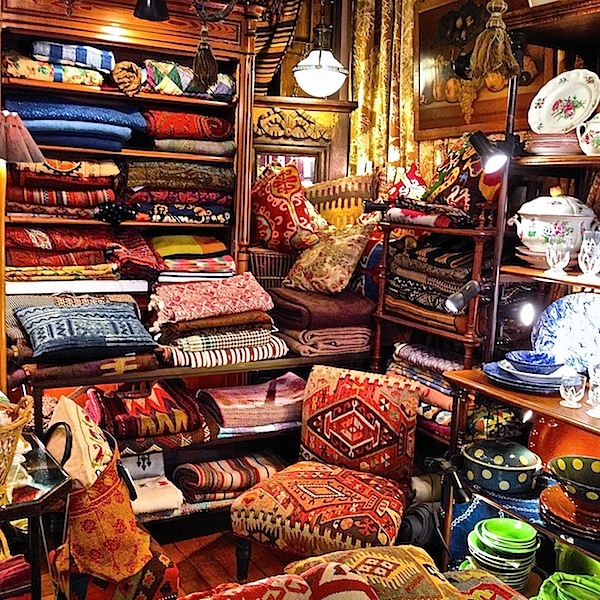 From new and old textiles to beautiful boutis, to tabletop and lighting, there is an expansive selection of distinctive items one might want to furnish or accentuate a home with. I don’t remember the provenance of this antique textile but its genre is clearly the basis for many covetable designs today. And I’m sorry this shot is not sharper. 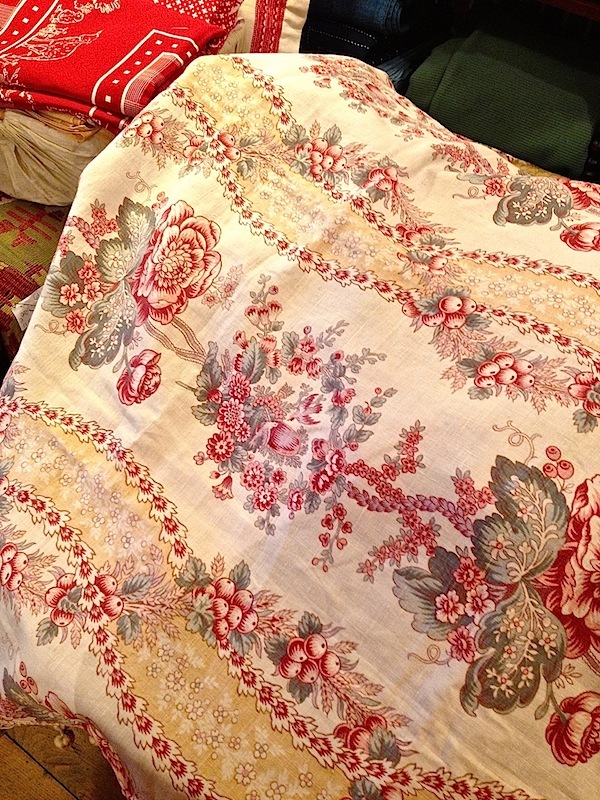 Clearly I was torn between looking, touching and documenting, but how charming are these alpine looking fabrics. Perfect for a chalet chic retreat. 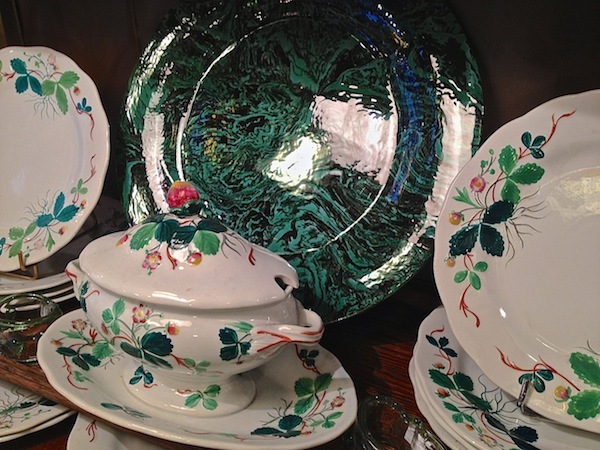 But one of my favorite aspects of the store was the custom pottery. 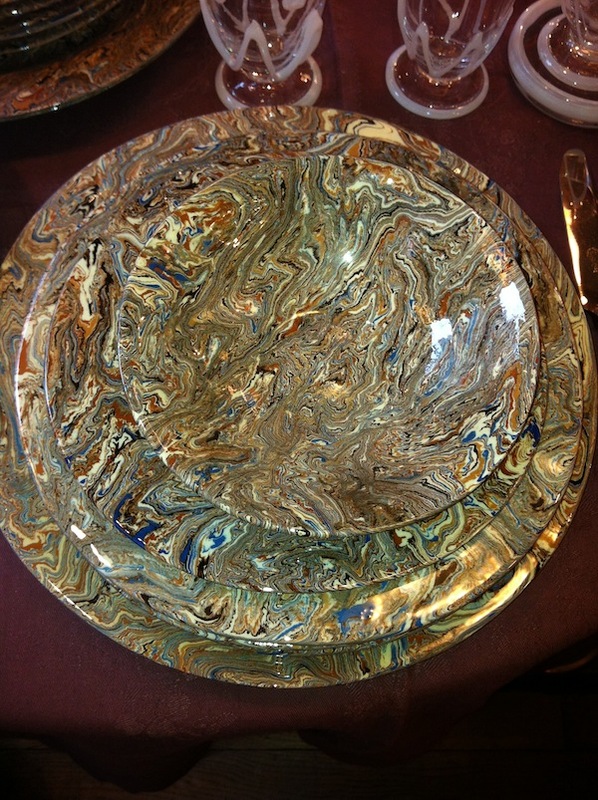 I have always loved aptware and Michele works with a faience factory to make these similarly marbleized patterns. In the back you can see the malachite version. It is dark, lustrous and fabulous. This predominantly taupe version is a bit warmer in real life and stunning. With subtle multicolorations running through it, it could easily pair with a variety of hues. But my favorite and of course the most expensive, was the blue and white. I adored that the pieces are so ununiform. Note how the bowls have a more fluid, bleeding pattern. And while we’re at it, I’ll take the lovely etched glasses as well. 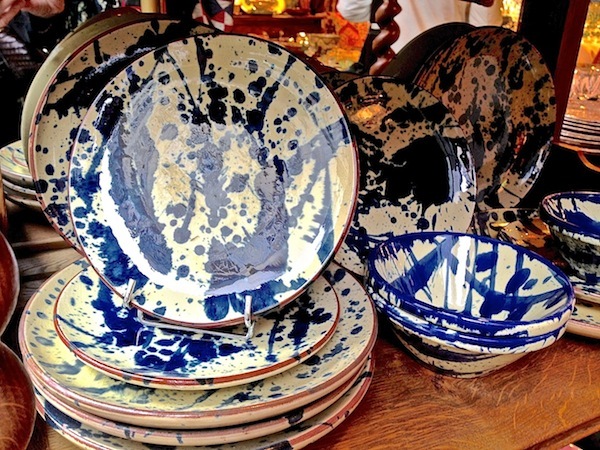 There is another blue and white pottery, more like splatterware. With it’s clay colored edges and erratic patterning, it is the rustic chic Jackson Pollack of pottery. A true anachronism, Michele has no computer access – no website or even email. To contact her, you can call (phone number in first shot on door) or fax or of course stop by on your next trip to Paris. I know I will be! And stop back here soon for some more of my favorite Paris finds. This entry posted in design, furniture, gifts, interior design, travel. Entry Tags: decoaraing, Home, interior design, Paris, Textiles, Travel Bookmark the permalink. What a treasure trove! Thanks for sharing this wonderful discovery! Stacy what a find! 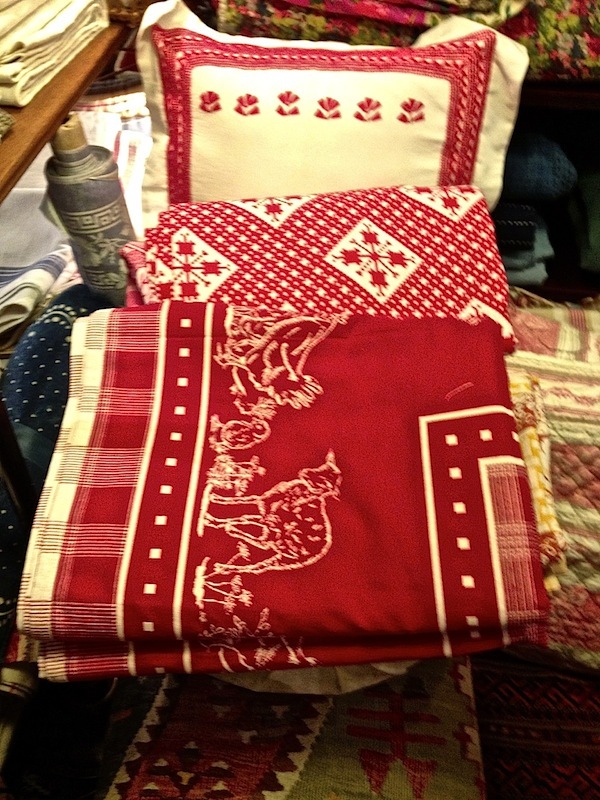 And my favorite, textiles no less..heaven! This post was tailor made for me and I can’t wait to go back to Paris and visit this gem of a shop. Happy Fourth of July to you! One of my favourite shops!… and after a long browse, just a hop and a skip away from Laduree! Wow, I love seeing this shop again. I remember it from a past trip to Paris and was also overwhelmed by the beautiful, eclectic nature of this small space. An absolutely unforgettable visit on the BEST street for a unique shopping experience, Rue Jacob. 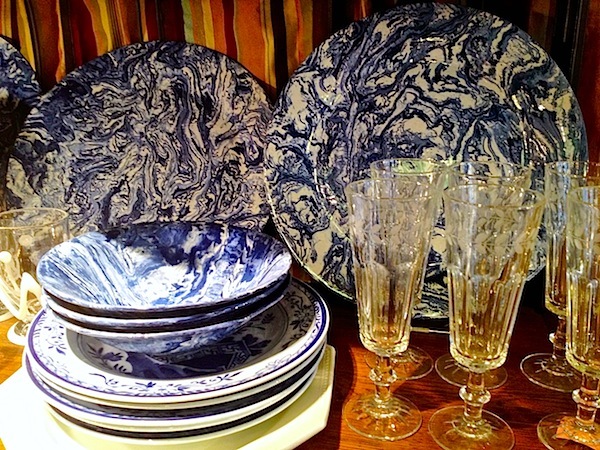 Thank you again for posting pictures especially of the stunning pottery! I am drooling. The pottery, the textiles and most of all that slipper chair upholstered in a vintage kilim. Heaven! The moment I stepped through your photographic door, I recognised this familiar haunt! It is easy to get lost there …. I remember looking around at more dazed faces and it occurred to me that this was indeed a rare find! Thank You! 78 queries in 0.442 seconds.